Now that you have made the decision to hire a caretaker and have chosen the candidate who will be living with your family on a full-time basis, it’s time to start making those much-needed preparations. For most parents new to the nanny scene, these are usually the first feelings that come to mind. Allowing someone to be a part of your family and watch after your children as their own is no small matter, but there is no better way to facilitate the transition than by getting your house, and your little ones, ready in advance. Everything else aside, ensuring your child is comfortable and content with the fact that they are going to have a new nanny (whether it be for the first time or replacement) should be your number one priority. With that, it’s recommended that you have a sit-down talk with them; instead of merely telling them what they should expect, be sure to ask how they feel. Allow them to ask any questions about the new nanny and the role he or she is going to play in your family. Of course, the flow of the conversation should be appropriately tailored to your son or daughter’s age group, but letting them speak is important nonetheless. Keep in mind that they may be confused about why the nanny is necessary, so highlight the new caretaker’s positive attributes (like the fact that s/he is very fun, s/he is excited to meet you, or s/he loves playing games). As a means of avoiding potential emotional issues, the transition to a live-in nanny should be slow and easy-going. The same goes for communicating all pertinent information to the caretaker. They should be well aware of your child’s daily routine and any medications he or she may be prescribed upon their arrival. Stress the importance of maintaining this routine, and work with them to make any needed adjustments; accommodating a new family member can be challenging, but it’s by no means impossible. It may take some time for everyone to adjust, but after a few days, the presence of the nanny will be your family’s new normal! Be sure to provide the caretaker with copies of all relevant phone numbers and contact information. This can include those for the school, the family doctor, and close friends and relatives. The nanny will also need a set of house keys and access cards for any community centers your family attends. 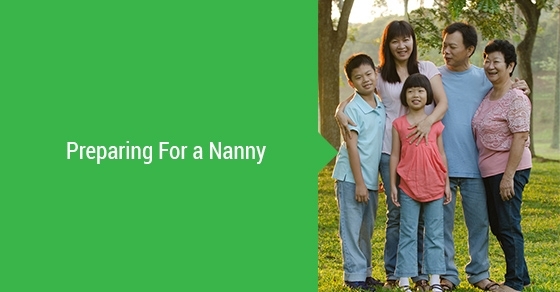 The most simple way to ensure you properly prepare your home, your family, and your nanny for the transition is to ask yourself: If I were coming to nanny in this home, what would I need to know in order to successfully do this job? If you have given your nanny all the information surrounding this question, then you’ll be adequately prepared for your new hire!